Access Sky Cinema live and on demand. 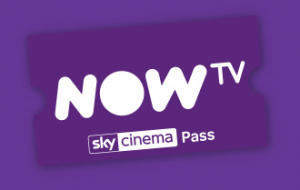 After pre-paid period, Sky Cinema Month Pass automatically renews at its then standard price (currently £9.99pm) unless cancelled. Offer price lost if you cancel your Pass before the last month of the offer period. 18+. UK only. NOW TV account set up with debit/credit card required. Streamed via Broadband/3G/4G/Wi-Fi (min recommended speed 2.5Mbps, charges may apply) to compatible device – see list on nowtv.com. Channels are subject to change. Voucher must be redeemed within 1 year of purchase otherwise void. Terms apply.